I've got a lot of time for novellas. Or rather, I only have a certain amount of time available to me for reading prose fiction, and novellas afford something approaching the substance of a novel with the practical brevity of a short story. This has been pertinent as I've been making my way through Alastair Reynolds' Revelation Space universe, a hard-science-fiction-future-history which has become something of an obsession of mine over the past six months – a mild, manageable one, but still a persistent strain in the broader science fiction fever which has infected me. 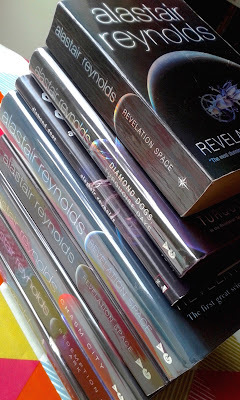 Five novels form the backbone of the series – Revelation Space (2000) and its two sequels, Redemption Ark (2002) and Absolution Gap (2003), plus Chasm City (2001) and The Prefect (2007; that last one will gain a sequel – Elysium Fire – and a new title, Aurora Rising, next year) – but around those are arranged five short stories and seven novellas, and these have played a not insignificant role in the development of my mild, manageable obsession. For while the Revelation Space universe novels for me represent a major investment of time – they're all around 500 to 600 pages long, which translates as probably a couple of months' worth of reading apiece – the short stories and novellas are quicker, less daunting reads. They're also really, really good in their own right – stylistically and tonally varied, hard SF stories which sketch in some of the background to the Revelation Space universe – "Great Wall of Mars" and "Glacial" are particularly significant here – and/or afford glimpses into some of its murkier, more obscure corners. 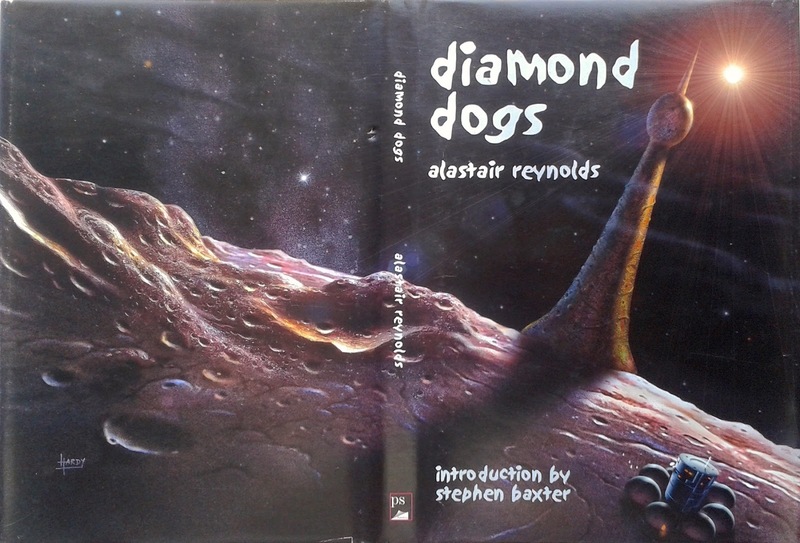 Most of the stories are collected in the 2006 collection Galactic North, but a handful aren't, notably two novellas which were published separately as limited editions in 2001 and 2002 by small press publishers and then brought together by Gollancz in 2003: Diamond Dogs and Turquoise Days. I found a first of the Gollancz edition for £2.50 in Camilla's Bookshop in Eastbourne in April and read it on holiday in June, and Diamond Dogs in particular really got its hooks into me: a queasily gripping, unsettling, gothic tale of obsession that for the most part takes place inside an alien artefact – the Blood Spire – on a planet, Golgotha, far from human-colonised space. It brought to my mind the 1997 film Cube – which is obliquely referenced in the story, along with Raiders of the Lost Ark (that film's opening sequence especially) and Algys Budrys' Rogue Moon, all of which should give some idea of the direction of travel – and, more obscurely, P. M. Hubbard's A Hive of Glass, at least in terms of its theme of the bloody extremes that people will go to to get what they desire, if not its scything body horror. In fact, so affecting did I find the thing that I wound up buying a copy of the original 2001 standalone first, which was issued by PS Publishing in an edition of 500 numbered paperbacks and 400 numbered hardbacks, all signed by Alastair Reynolds. 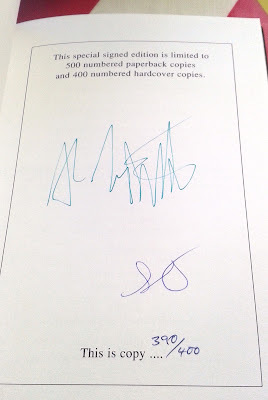 Taken with the evocative David A. Hardy cover art – and the fact that it was signed – I'd been idly looking at listings for the hardback on eBay, considering stumping up £30–£50 for a copy, when I spotted one on Amazon Marketplace for a fiver. I snapped it up, and discovered when it arrived that not only was it brand new and unread, but it had been signed by both Reynolds and fellow SF author Stephen Baxter, who wrote the illuminating introduction. A nice addition, then, to my growing Revelation Space universe collection. Linked in Friday's Forgotten Books, 22/9/17. 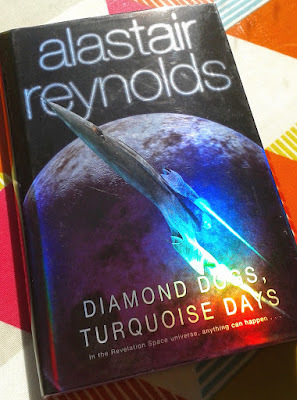 I've enjoyed all of Reynolds's SF novels. You certainly got a bargain with that signed edition! Thanks George – yes, I was rather pleased with that one!